Craft South is proud to be an official JANOME dealer. Whether you have never sewn a stitch, or are a seasoned pro we have the perfect machine for your needs. Each purchase also includes one on one training with our expert instructor to ensure that you get the most out of your Janome. To schedule a consultation contact us here or just stop by the shop. The relationship with Janome goes beyond selling sewing machines for Craft South. Owner, Anna Maria Horner, is the spokesperson for the brand and has collaborated with them for the past few years to bring you original and inspiring projects! The partnership is a natural fit since Anna Maria has been sewing with a Janome for 20 years and purchased her first machine as a young, creative entrepreneur. Now she can bring her love of Janome to you, both in the shop and online. Each of the projects has a pattern + instructions download along with a video highlighting the steps. Visit the Janome + Anna Maria Horner page to see what you can make today! The Magnolia 7330 is a small but sturdy machine that's great for beginners! Perfect for creating any kind of home decor or sewing project, it enables you to add your personal flair to your home and wardrobe. You'll get 30 decorative stitches, and lots of great automatic features. Incorporating the same Janome precision and technology that goes into all of our machines, the Magnolia 7330 helps you define yourself at a great price. With sturdy construction and stable feeding, style follows substance in the well equipped and intuitively designed Janome 4120QDC-B. 120 stitches, twin-needle functionality, superior editing, and mirror stitching are just a few of the cutting-edge features of this special machine. 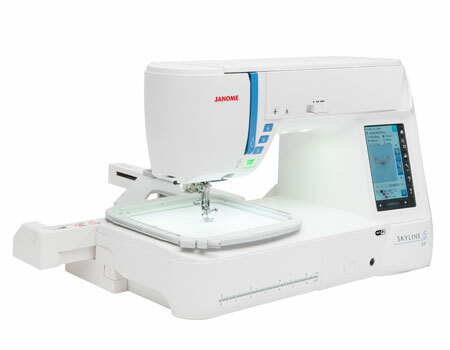 The Janome 4120QDC-B has the power, precision and convenience you need to realize your creative potential. 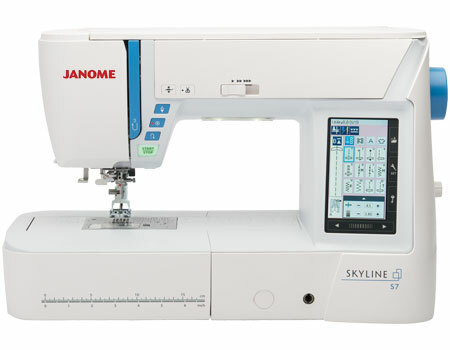 The Skyline S9 includes both sewing and embroidery. This great machine includes Wi-Fi capability that makes it easy to send embroidery designs from an iPad or computer straight to the machine. In addition, Janome has developed five amazing iPad app to help make your embroidery better. Enjoy AcuDesign, AcuEdit, AcuMonitor, and the new AcuSetter and AcuSketch.